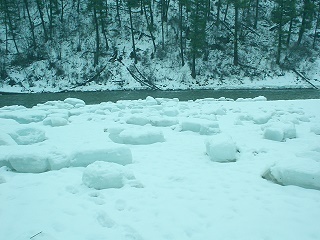 01.01.06: Huge ice chunks leftover from frigid temps. 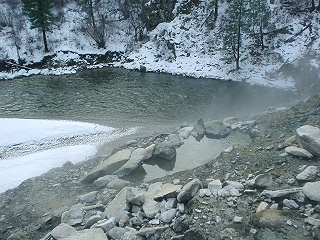 A variety of natural hot springs pools by the South Fork of the Payetter River. Located just a short hike from a campground trailhead which is only a few miles from Lowman, Idaho. The .25 to .75 mile trail (depending on which pool) begins in the campground of the same name. Pools are rock and tarp walled with gravel/tarp bottoms. Conditions vary greatly. Usable all winter, sometimes the road into the campground is closed in which you can usually park at the CG entrance and walk in, if the road isn't closed I would advise that you only go down it if you have 4x4 capabilities (if snow/ice are present on the roadway), the roads in and around the campground can be sheer ice. Otherwise, open year around. 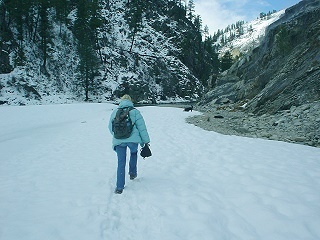 Pine Flats is an actual National Forest Campground, the hot springs are under a mile away. Other NF camping sites/areas are also available nearby. The rewards can be bountiful. Solitude. Peace. Tranquility. Renewal. Revitalization. And, maybe… just maybe you’ll slip through a crack in the weather into a sunny, mid 60s Spring day in the forest… and find yourself enjoying a hot waterfall. Like I did. The only pool suitable for soaking was the "round the bend" pool. Which, aside from requiring an umbrella to avoid drowning under the hot waterfall, was barley accessible by fording the river. Spring runoff is in the process of pushing the Payette's water levels up up up. You can still reach it from the more difficult (very steep, small cliff drop) route and the secret entrance of course. ;) I think with some careful flow adjustments a pool or two could be brought back to life at the top by sacrificing the two lower pools that have never been very warm. Yeah!? Didn't run into anyone, but past 3 youngins in shorts, t-shirts and flip-flops dragging a giant cooler behind them into the void. The pit toilet was unlocked and clean despite the campgound closure. Pine Flats was awesome. Not the soak, but everything else. All of the pools except one tiny soaker up top were too cool (upper 90s) for school. It was just nice to hike around and look for signs of spring. Oh, and no trash to pick up is always a treat. After all of that hiking, it was time to return to Hot Springs Campground. It had been a couple months. I was antsy to get out. So, I took off Friday evening for Pine Flats. There's nothing quite like a hot soak under the stars in Idaho's backcountry during winter. The gate into the campground of the same name was open, and I was able to drive down to the trailhead parking area with ease, not much snow/ice here... yet. After the brief hike to the 'round the bend' pool I began my routine. First, I started by dropping my non-waterproof digital thermometer into the pool. Then, I finished off by falling into the pool with all of my clothes on, coat, shoes and all. Not so smooth considering the air temperature was below 20 and I still had to hike back out. I then proceeded to make another smooth move. I stripped down and immediately climbed into the pool... not fully knowing the temperature. After a few minutes of shivering I decided that it was around 96. Not good. At least my coat was somewhat dry, but my shoes and pants were drenched. Needless to say, I enjoyed my truck's heater after the return speed-hike. All things considered, I ventured out because I needed a break from the norm. It turned out to be a pretty fun trip regardless. My soaking companion thought it was a riot. For some reason I neglected to see the humor in it until a few hours later. A huge plus to the whole debacle was that I found Pine Flats to be trash-free for the first time in years. Not much new to report here... all of the pools were too cool for a soak. The hottest clocked in at 98 degrees. *sigh* I miss the days when Pine Flats was a 5 star soak. I was unable to reach the pool around the bend due to runoff conditions. However, shortly before I left, I heard a report that the 'round the bend' pool was also too cool for soaking. Upon arrival, the campground was empty save for the newly arrived host that was visiting with people in a Forest Service truck. With approaching temps in the 80s, I imagine this will be the last time until September that you'll find the campground virtually empty. On a side note, I took a low-clearance car instead of my truck and slammed into a rock the size of a football that came down during a rockslide on the Banks-Lowman Highway (17). Spring thaw brings about conditions ripe for slides, please drive carefully. Good ol Piney just isn't the same. The 1st pool you come to (slightly) above the river was too cool for soaking. The long, skinny pool further up on the mountain side needed some TLC as it was in disrepair and lacked hot soaking temperatures. The next pool, which lies just past the first, can be found by following the river bed halfway around the corner. This semi-new pool was also too cool for soaking, although it looks like many have made attempts at improving the soaking conditions. That left the final, waterfall fed pool. 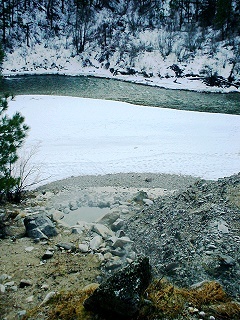 This pool turned out to be unreachable; recent warm and rainy conditions have brought the river level up - submerging the path around the river bend. The secondary access route, from above, was too treacherous to attempt. Slick snow and ice coupled with loose mud easily deterred us. The hike was beautiful, and the many foot soaks in mostly hot water was enjoyable. Better luck next time! 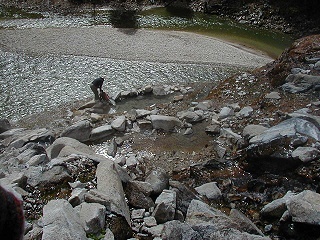 Walking sticks and trekking poles would definitely aid in the steep decent down to the waterfall fed pool. What an incredible day-trip! On our way to the hot springs we must have passed at least 500 Elk! At times I had to stop the truck because of all of the herds running wild, weaving back and forth across the highway! 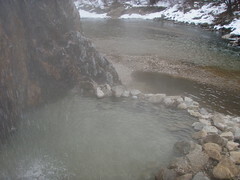 And, as soon as we climbed in the hot springs around the bend it began to dump snow! To top it off 3 deer came upon us and gazed for a bit before departing. The only beef I had was that the hot springs were a bit on the cool side. There were times when a surge of hot would hit, but sadly the occurrences were too few and far between. Sweet! There were a few campers and day hikers, ironically no one was soaking in any of the pools though. I was happy to see my favorite waterfall-fed pool had been improved enough that it's temperature and depth both increased. The majority of the other pools were in excellent soaking condition as well. 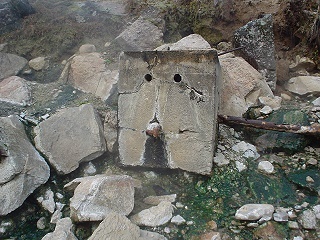 Oh yes my friends, this was a great trip... reminiscent of earlier trips to these great hot springs. Multiple soaking options prevailed to multiple instances of soaking. The weather was brisk, permitting for all day soaking in the sun. We had the whole place to ourselves until we left, which is when we passed another group en-route to the hot springs on our way out. Pine Flats just isn't what it used to be. Don't get me wrong, I love this place, but recent pool re-designing has brought about not so optimal soaking temperatures. The only pool suitable for soaking was the lowest pool (see 10.23.03 pics above), which also had fairly moderate temps, but were at least much warmer than all of the others. So-so trip to good ol PF this time. Someone is still trying to build the perfect soak here, meaning the location and temp. of the pools is in a continual state of flux. The upper pool was hot hot hot, while all of the other pools were just too darn cool. I wonder what spurred all the changes? Just a little over a year ago the pools had remained in the same place and there always seemed to be a good soak at hand. Surprisingly, the road to the campground was open (no snow anywhere) and there were even a few campers. None the less, it was a beautiful day and the hot soak (even though quick) was nice. The worst part of this trip was the amount of trash. Out of all the times I've been here I've never seen as much trash as I did on this day. Sad. Excellent trip. 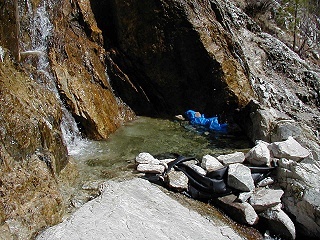 The highlight was a new 12x6, 2 feet deep soaker closest to the source on the side of a rocky cliff. Just below it is the pool pictured above. Some kindred soaker had left a nice tarp near the larger pool because of semi-sharp rocks in parts of the bottom. I wasn't able to take any pictures this trip because I forgot to bring batteries. The pool around the bend fed by the hot waterfall was sadly too cool for soaking, for the first time of my many trips here. I am inclined to believe that the new pools constructed above the waterfall are diverting some of the hot water that once fed pools 5 and 6 (pictured above). The new, large pool is easier to access year-round, whereas the waterfalls pools are much tougher to reach during the warmer months. I just really liked that pool. Although the road into the campground of the same name was completely drivable, the gates at the entrance were closed, so that's where you have to park. I didn't see anyone else the whole time there. There were however, 6 cars parked in Skinnydipper's pullout on the way back home. This trip was a bum deal. 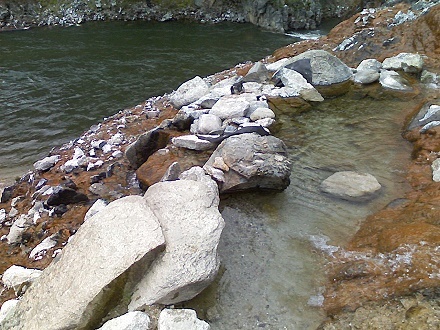 We passed a couple soakers on the trail to the springs just to find one two-seater pool that was too cool, a new two-seater below the source next to the river that was way too cold and that the new 4-person pool had been drained and partially dismantled. Man, it was only 6 days ago since we were last here! It was dark again and with the dog we again chickened out on the trek to the sweet pools around the bend. This was a cool (in a good way) soak. We arrived around midnight and sat in the 1st and 2nd pools below the source. We didn't make it to our favorite spot (around the corner) because of the high water conditions and were too chicken to trek there in the dark. There was also a beautiful meteor shower occurring as we sat in the pools. My traveling companions on this particular trip were Billie, Penny and Sara. We drove past (slowly) plenty of animals on our way back from Pine Flats. This HS is one of many located just off the Banks-Lowman Highway. This one is closest to Lowman and also accessible via campground of the same name. Pine Flats was sweet soak... as usual during the off-season. 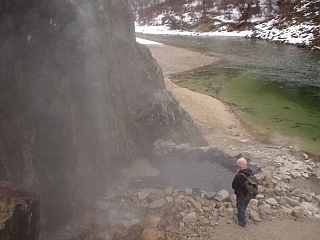 We bypassed the first couple of pools and rounded the corner to the premier soak sporting the hot waterfall. By the time we were leaving we counted around 5 smaller groups of people heading to the springs. We were feeling pretty lucky to have had the place to ourselves for a few hours. The road into the campground was not drivable. We returned two weeks later to find quite a few campers and soakers alike. Enough to fill all the available pools with people! All clear at 7 and 11am. The entrance to the campground was gated with two cars parked in front at noon. The campground was near half capacity and the hot springs trailhead parking lot was roughly 80% full of drive-by soakers. Lots of campers and soakers! The campground of the same name had only a few groups of campers. This place is getting more and more popular as the years progress.